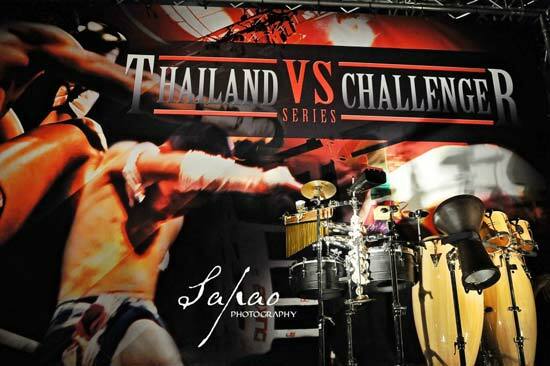 On November 6th, the Thailand VS Challenger (TVC) Series, sanctioned by the WMC, the world governwing for the sport of muaythai, returned to Germany for what was the second Thailand VS Germany programme and the third TVC event to have been held in Germany. In an exciting night of both muaythai, the main event ended in a draw, while there was also a boxing title fight qualifier in the undercard. After the success of the inaugural Thailand VS Germany event in the German city of Ulm last November, promoters Elite Boxing once again brought TVC to the Blautal Centre for the final event of the 2011 series. Jointly organised by local subsidiary, Elite Boxing Germany, it was the third time a TVC event has been held in Germany following last year’s Thailand VS Germany and the Thailand VS Europe event in Stuttgart in September this year. The sell-out crowd of 2,000 packed into the Blautal Centre was treated to a full evening of fast and furious entertainment. The pre-event undercard included a lot of fighters from the Elite Boxing Germany Gym in Heidenheim run by the head of EB Germany and co-promoter of the Thailand VS Germany event, Serdar Karaca. Still as passionate about muaythai as he was at the height of his own fighting career, Serdar even took on the role of corner man for the fighters from the EB Germany gym. There was also an important milestone for EB during the evening as a German boxing 167 ponds title fight qualifier was incorporated into the undercard. Issa El Sleiman, an old friend of EB co-founder Toli Makris, won his qualification fight to earn him the right to fight for the German title. Following the success of this experiment, EB is hoping to add a German boxing title fight into the fightcard of Thailand VS Germany 2012 at the same venue. For the main event of the evening, the Thailand VS Germany muaythai event finished with honours even as Germany and Thailand each won two fights. First up was Juri Kahl of Germany facing Jaipet Black Dragon Swiss of Thailand. The German fans were on their feet in the third round of this exciting fight when the home favourite broke the Thai’s nose and ended the fight with a vicious elbow uppercut. In the second match-up, Wuttichai Tor Taisong evened things up with a points win over late replacement Valdet Gashi. Valdet had only stepped in as a late replacement after Thai-based German fighter Muci had been forced to drop out one week before the event after an accident. Representing Germany in the TVC Grand Opening in Bangkok in July, Valdet had been on the wrong end of what many saw as a bad decision when he lost on points to his Thai opponent. However, there was no disputing the decision this time as he was outfought by his wily Thai opponent. The third fight had the fans going wild as Bernueng TopKingBoxing of Thailand took on Alex “Iron Hat” Vogel of Germany in a fast and furious demonstration of Muaythai. The German certainly lived up to his nickname as he appeared to be soaking up a non-stop barrage of attacks from the aggressive Thai, but he finally succumbed in the 4th round and the fight ended with a KO win for Bernueng. The final fight saw a fine technical fight between Enrico Kahl, brother of Juri, and Jaochalarm Chatkranok Gym of Thailand. The two fighters went the distance with the German just winning on points. The TVC 2011 Series has now come to an end, but Makris is promising some “very special” events in the 2012 series. This entry was posted on Friday, November 18th, 2011 at 12:06 PM	and is filed under News.